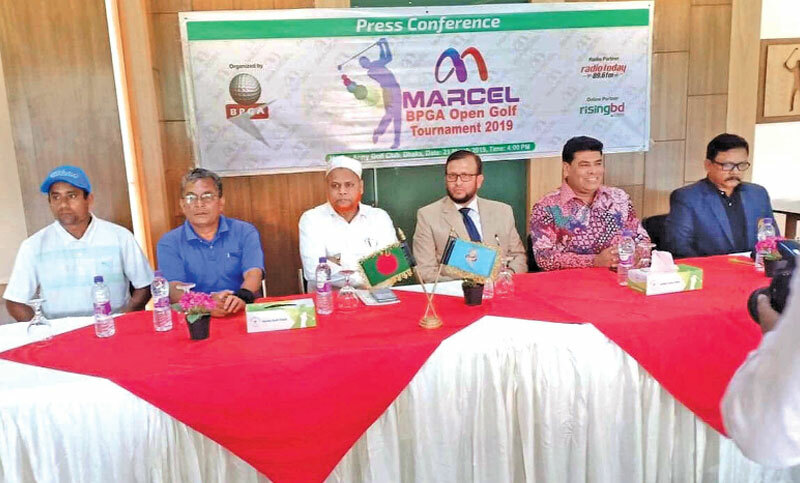 ‘Marcel BPGA Open Golf Tournament-2019’, a golf tournament for the Bangladeshi professional golfers will be held at Savar Golf Club in Savar Cantonment. The four-day long event will commence from March 24 and will conclude on March 27 at the same venue, sponsored by country’s largest electronics products manufacturer company Marcel BD. A total of 110 golfers including local and foreign players will take part in the forthcoming tournament. The prize money for the four-day meet is 15 lakh taka. A press conference in this regard was held at Army Golf Club, Dhaka on Thursday. Bangladesh Professional Golfers’ Association (BPGA) President Lt Col Khandaker Abdul Wahed (retd) and Secretary General Brig Gen Md Ahsanul Huq Miah (retd), Marcel BD Executive Director Dr Md Shakhawat Hossain, Walton Group Executive Director FM Iqbal Bin Anwar Dawn, BPGA Joint Secretary Maj Golam Morshed (retd), Golfer Shakhawat Hossain Sohel and other senior officials from Marcel BD and BPGA were present at the press meet. BPGA President Lt Col Khandaker Abdul Wahed expressed his delight to be able to organise the meet. “We are very happy that BPGA is hosting the first ever “Marcel BPGA Open Golf Tournament.” I congratulate to Marcel for providing sponsorship in such tournament,” he said. “We will extend all of our support to make this professional golf tournament a huge success,” he added. “I hope Walton Group and Marcel BD will give at least one sponsorship each year from now,” he said. “Our golfers can bring in a success for the nation through this sport. I will provide all kind of support for the development of golf. We will carry it in future,” Marcel BD Executive Director Dr Md Shakhawat Hossain said.